One of the unique characteristics of grass-only beef is the yellow fat. Although when you unpack a roast or a steak at home you won't typically notice that the fat has a yellow pigment to it, it's very noticeable when you see the entire carcass before it gets cut-up. In fact, if you see one of our beef carcasses hanging in a cooler, you will immediately notice that there is very little fat on the carcass, and that the small amount of fat has a clear yellow pigment to it. It looks absolutely nothing like a grain-fed beef carcass. Grain-fed beef has a thick layer of white fat coating the carcass. Yes, the tremendous fat content on a grain-fed carcass is a pleasant white color. But how healthy is it? Researchers tell us that fat from grass-only beef is not only safer for us, but essential to our health. The secret is in the color of the fat. So why is the fat from our beef yellow? Simple: carotenoids. These are naturally occurring pigments found in plants. There are dozens of types of carotenoids, including lycopene, lutein, zeaxanthin, and astaxanthin --- although perhaps the mostly widely known is beta-carotene. Why their fat is yellow: Our beef cows grazing summer pasture. The specialists tell us that these pigments are crucial to our health. One of the reasons is that they get converted in our bodies to vitamin A, and protect our bodies from environmental damage. Grass-only beef has high amounts of these healthy carotenoids, as referenced in various studies (Nutr J. 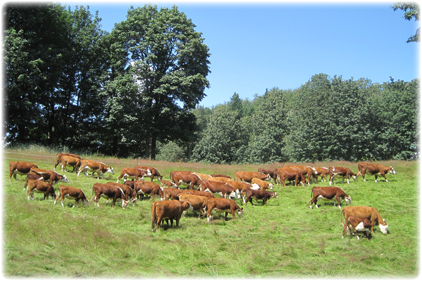 2010; A review of fatty acid profiles and antioxidant content in grass-fed and grain-fed beef. Daley et al.). When our cows are grazing summer pasture, as in the above picture, they gorge on grasses and other plants, which then get converted into meat. The nutrients from the plants get stored in the meat and fat of the cow. The cow is healthy, and their health gets passed on to you. Right now it is a beautiful time of year, and the cows love it. The pastures are thick, alive with abundant new growth. The soil microbes are feasting on organic material, the plants are sucking up nutrients, and the cows are on a pasture-binge that will help them add many pounds of precious healthy fat to their sleek and glossy bodies. Yes, they grow much slower on grass than they would on grain. But the result is worth it: healthier cows, healthier people, and a healthier planet.